Dwayne Perreault — To say x is x is being obvious, yet there is a deeper meaning. X is x is an affirmation of itself, that only x can be x. And so we get France is France, life is life, war is war, that is that. If I say George Bush is George Bush, you know what I mean. But now try saying, wine is wine. Doesn’t work for me. And I’m not sure I’d say Pomerol is Pomerol either, since I’ve tasted a number of Pomerols now, and each time I seem to taste a different wine. I’ve had heavy, pensive, iron-rich Pomerol, autumnal Pomerol with wet forest and truffel smells, and Pomerol that was so purely neat in extraction that I thought it had something in common with elegant Burgundy. It’s such a tiny area, so how is this possible? Is it because of the capricious Merlot grape, which offers so many different kinds of wines around the world? Is it because of the many small and different winemakers? Or is Pomerol so complex that it takes years of serious tasting to understand it? Whatever the reason(s), there is much to be desired about Pomerol except its price. If the rule in thumb is, don’t buy a bottle of Bordeaux for under €10, then I guess that becomes about €30 in Pomerol. Let’s not even comment on what top-rated Chateaux like L’Evangile and Pétrus cost. So I’m happy to beat the odds and present the following splendid wine for €25: Château Hermitage Mazeyres 2007. This is very much a fruit-driven Pomerol made from 80% Merlot and 20% Cabernet Franc, with enough structure to keep it solid and fulfilling yet remain elegant. Having leather and a hint of sandalwood and violets in the nose, it is very expressive with tangy dark berries and medium tannins, round and harmonious, a festive wine to keep you happy through the cold winter months. 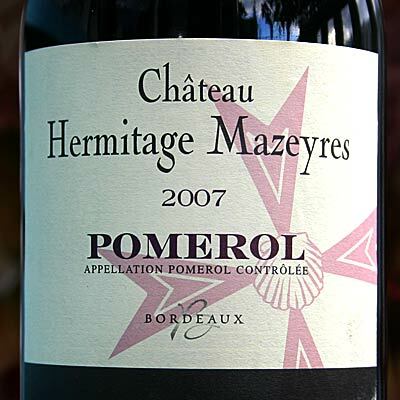 Château Hermitage Mazeyres is from Barrières Frères, owners of the St. Julien 4th Grand Cru Classé Château Beychevelle, and the Cru Bourgeois Supérieure Château Beaumont, which I also sell. Hugh Johnson, in the fourth edition of his Wine Companion, had this to say about Pomerol: “There are wines as potent and majestic as any in France cheek by jowl with wines of wispy, fleeting fruitiness and charm – and dull ones too.” Is Pomerol then Pomerol? Who cares? Good wine is good wine. "Bordeaux 2010 probably even better than 2009"